I haven’t posted anything in a while. I had a little bit of transitioning going on in my life and could not find the will to write. If you’re a reader of mine you know about past issues I’ve had with my Companion Chyna. If you’d like, you can read about what was going on here. Things did not improve and we unfortunately had to make that dreadful decision. We opted for a veterinarian to come to the house. It was definitely a more peaceful experience for us all. I highly suggest this if you are ever in the position to make the decision of putting your pet down. Throughout this process, I did a lot of contemplating. I’ve always considered a dog’s attitude to be a perfect example of how to live your life. A dog wakes up, wagging their tail, happy to be alive. They don’t care about what happened yesterday and they don’t worry about what’s going to happen tomorrow. With that being said, I recognized some traits that Chyna had in her life that have shown me what the exemplification of love looks like. 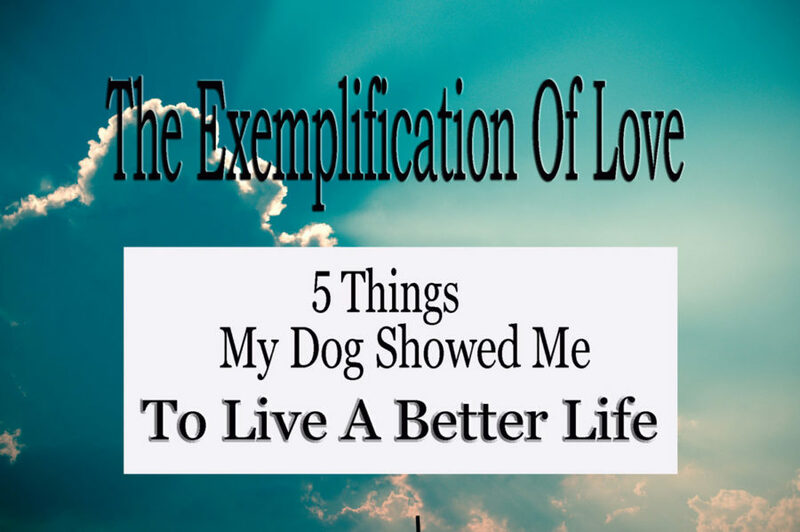 Here are 5 things my dog showed me to live a better life. Chyna’s first year of life is unknown. When she was found she was emaciated with scars on her nose. Our girl was a Pit Bull and we believe someone was trying to use her for dog fighting. She also just had a litter of puppies and all her pups were adopted, leaving her all alone. Chyna had a lot of fear in her and coward whenever you tried to pet her. Eventually, she moved past that fear and lived a life of fearlessness as she approached every new person she met. This is a perfect example of how we should approach life. Yes, we have all had things happen to us. We all have our story. But, in order to move forward, you must let go of fear. Make the decision to go for what you want! In order for Chyna to move past all her fears, she had to forget the past and forgive “humans” for the things that were done to her. Often times us humans remain stuck because we continuously relive things from our past. If you want to move forward you must have a forgiving attitude. Let go of blaming people and situations that may have hurt you in the past and your future with be a brighter place. Let go of the sack of burdens you’ve been carrying around everywhere you go! Chyna truly had a loving heart. She greeted every person she met with a wagging tail and a deep interest in discovering who they were. Each day was a new adventure to experience the wonders that the world had to offer. We tend build up walls each time a person or situation hurts us. Often times this causes us to live a guarded life. We question everyone we meet and think twice before we attempt to venture into unknown territory. The only way to live a wondrous life is to have a loving attitude. Stop assuming people are out to get you. Stop questioning if every new experience will harm you in some way. Live like Peter Pan and you will learn You Can Fly! 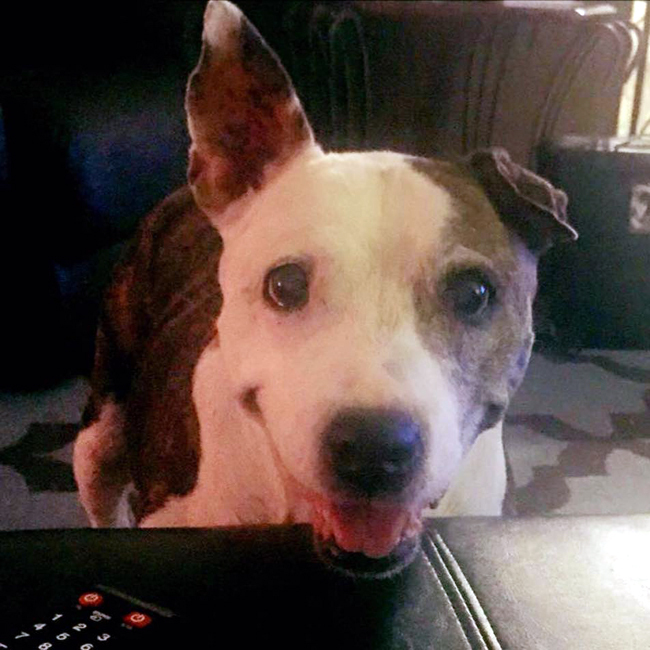 Chyna’s wagging tail was a sign that she was a happy dog. She had a goofball personality that made you laugh every time. She had so much joy it was almost contagious. Sometimes daily life can take its toll on us and we develop a grumpy attitude. This not only affects you yourself, but those around you. Read more here. If you want to live a more joy-filled life you must be conscious of the thoughts you’re thinking and the attitude/energy you extend out into the world. Be more joyful and you will experience more joy! She loved people food but did not grumble when we put dry kibble in her bowl. 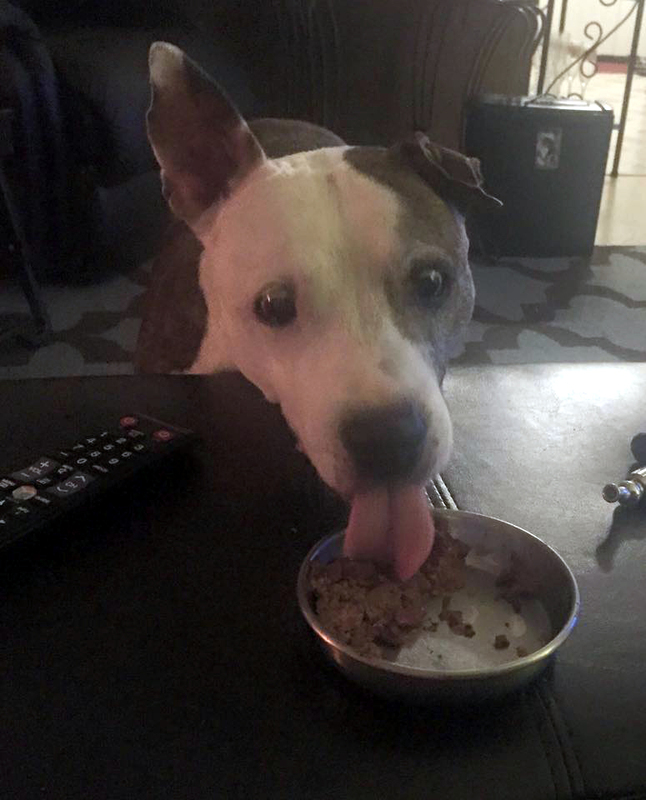 She ate dry kibble with the same appreciation as if it were a piece of barbecued steak (her favorite). How often do we take for granted the blessings in our lives? We’re so busy looking at what we don’t have that we forget to see what we do have. If you want to live a life filled with things to be grateful for try being grateful for what you already have first. When you have a grateful heart the doors to abundance will be flung wide open! As you can see, Chyna has left an impression in my life. She has definitely been the exemplification of love. Following is a poem I wrote that sparked this post. Have you ever had to put down a pet? Did you have someone come to your home? What kinds of things have you learned from your beloved pets? I am glad to see you back but so sorry about your dear Chyna. The one time I had to put a pet down my ex-husband and I did it our selves. A neighbor kid up the block beat my cat with a baseball bat. I don’t know how she found the strength to make it home but she did. We knew she wouldn’t make it through the night, she was just too broken. So we ground up an aspirin and put it in some milk to ease her pain and just loved her until she passed. Thanks, nice to be back in the swing of things. That sounds like a horrible experience to go through with your cat. Poor thing. People can be so cruel. They sure can be. I don’t get what possible pleasure the kid got from beating a her. He needs counseling! That’s probably not far from the truth. That anger is came from somewhere and those issues need to be dealt with. I try my hardest to look at acts of violence this way. They are calls for help. They can be, absolutely. That’s a good blog post idea Joe!